In 1552, the two thousand defenders (including untrained commoners and women) of a badly maintained, undermanned castle held off an Ottoman invasion army of 75 thousand, who left for home on 18 October after suffering heavy losses. 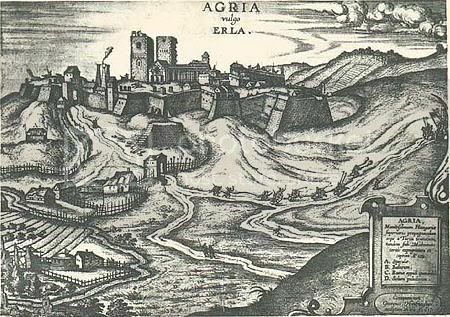 Contemporary drawing showing the castle of Eger (Latin: Agria, [later] German: Erlau), possibly showing a raiding party in 1552 leaving to pester the arriving Ottoman army. From UMÉ. The Siege of Eger in North-Central Hungary (not to be confused with Cheb in the Czech Republic, named Eger in German) was a victory celebrated across Europe at the time, and even Ottoman sources spoke openly about a big loss. On the longer run however, it didn't change the strategic situation, and was forgotten quickly. It wasn't until the very end of the era of national romanticism in literature that this episode of history was 'rediscovered', thanks to what became the most popular book on the Hungarian school literature curriculum. So when I watched Peter Jackson's rendering of the Battle of Helms' Deep in The Lord of the Rings: The Two Towers, many of the battle tactics appeared quite familiar to me. Follow me for a historical excursion in six parts below the fold. I will first set the stage in three steps, then describe the battle, tell what happened after, and close with the novel. Troops of the rising Empire of the Ottoman Turks first set foot in Europe as mercenaries in a local conflict in 1345. For the next half-century, such borrowed troops took part in almost every struggle of Balkans kingdoms. But the Empire itself, bypassing Byzantium, soon began conquest, too. In 1371, the Ottoman Empire defeated the combined force of Southern Slav principalities on the banks of the river Marica, and took today's Macedonia. The same year, the first Ottoman raiding parties reached the Kingdom of Hungary. Four years later, the first military confrontation came: when the King of Hungary led a punitive campaign against Wallachia (today's Southern Romania), whose ruler rebelled against his demands for vassaldom, and got Ottoman relief forces. For the next 150 years, the Kingdom was one of the Empire's two main rivals in the region (the other being Venice), the sides fought several major and innumerable smaller battles. The brunt of the fighting was suffered by the wide region from Bosnia to the Western banks of the Black Sea. (And suffered from both sides: it did happen that a Serbian despot took hostage the leaders of the supposed liberation army.) There were relatively few Ottoman intrusions beyond the border castles into Hungary proper (most of them were into Transylvania). Which is understandable when considering the strengths of the sides. I'd sum up the strengths of the Kingdom of Hungary in three points: the good exploitation of geography for defense within and beyond borders, and cavalry. The Kingdom of Hungary occupied the Carpathian basin: mountains all around. A double ring of strategic royal castles (called végvár = c. 'frontier castle'), built from after the Mongol Invasion (there was ensuing conflict with the Golden Horde until just before the Ottoman arrival), could control all roads in and out. The smaller Slavic, Romanian and Bulgarian principalities to the South and Southeast could serve as buffer states. In their hegemonic aspirations, Hungarian kings repeatedly forced the rulers of these into vassaldom. The most famous being Vlad Ţepeş, aka Dracula, a voivod of Wallachia (rather than Count in Transsylvania as Bram Stoker had it). For most of the time, the main force of the army was still the old feudal army, but it was effective. The one great weakness was weakening central power. Partly because from 1301, none of the mostly imported dynasties lasted more than two kings, and struggled with the feudal class for legitimacy. In contrast, the core strengths of the Ottoman army: motivation, cannons and numbers. The armies were diverse: both cavalry and foot soldiers; and proud feudal bands, well-trained professional soldiers, and loot-hungry mercenaries at the same time. But there was another significant attraction: a rise in the ranks, that is social mobility, was possible from all three groups, with any social (and any religious) background. The Ottoman Empire was among the first (if not the first) to recognise the strategic value of cannons, especially in sieges. And the Sultans strove to have the best, biggest and most cannons in the region -- say in the 1453 taking of Constantinople, the giant cannons of a Transsylvanian gunsmith played a crucial role. The Ottoman Empire was big, really big -- meaning lots of manpower. The loss of a large army did not hold up the possibility of assembling another for a generation. On the long term, there was no question who would endure in this match-up. This fact was not lost on some -- above all, the Hunyadis. John Hunyadi was a nobleman of Wallachian origin who rose to be a baron in the wake of some military successes. So when in 1456, just three years after the Fall of Constantinople, the Ottoman Empire thought to take on the next big opponent by cracking its defenses at the weakest point, along the Danube, only Hunyadi realised the strategic importance of the végvár Belgrade (Nándorfehérvár in Hungarian), and rushed there with his own troops. The c. 20,000 soldiers inside and the giant guns and 60-70,000 men outside (modern estimate) fought to a standstill. But, waiting on the sidelines was a makeshift crusader army of c. 30,000 peasants recruited by a friar. These started a foolhardy attack across the Sava river, but then the knights saw opportunity in the chaos in Ottoman lines, and Hunyadi's cavalry joined in what became a rout. Unlike the battle I'm about to describe, this was a strategic victory: no further major invasion was attempted for 70 years. John Hunyadi died of plague spreading on the battlefield. But his son would become Hungary's last strong king as Matthias Corvinus. He only had relatively minor battles with the Ottoman Empire: sieges of individual castles, punitive expeditions on the Balkans, and sending a relief army to eliminate the (rarely remembered!) beachhead the Ottoman Empire established in Italy, at Otranto. However, Matthias prepared for a bigger showdown. On one hand, learning (and recruiting) from the Hussites, he built a large standing army (the first in post-Roman Europe) of mercenaries, fed by punitive taxes. On the other hand, he thought to match the Ottomans' economic strength by expanding -- in the other direction, conquering with armies or dynastic deals most of Austria, today's Czech Republic, and even a bit of modern Saxony in East Germany. He also curtailed the power of the barons. But Matthias died early (in his then seat Vienna in 1490), and the barons soon brought back the pre-Hunyadis status quo. And this time, the Ottoman Empire was circumspect and took its time in preparing the ground: remaining buffer states were assimilated, and strategic Southern castles were taken one by one. Then, in 1526, Sultan Suleiman I the Magnificent felt the time was right for a big invasion. The Hungarian troops had to meet it on the open field -- and in the Battle of Mohács, they were slaughtered in a decisive defeat. However, I think both of these are BS: the Ottoman victory at Mohács was like a replay of the English victories at Crécy and Agincourt, except with cannons in place of longbows. That is, a strategic retreat lulled a foolish feudal army of mounted knights into firing range; a few ten thousand more knights would only have meant a bigger massacre. And there was a reason for lack of foot soldier support like at Belgrade. 12 years earlier, the Church wanted to organise another crusade against Ottoman advances. But the noblemen hindered their peasants from leaving their fields. This conflict grew, in the end, the crusade turned into a massive peasant revolt. It was crushed summarily -- and was followed by the legal enactment of the Second Serfdom. This involved a ban on serfs bearing arms. Just three years after Mohács, another invasion army passed through for the First Siege of Vienna. From there, Western history books usually jump straight to the Second Siege of Vienna (1683), but in truth, there were several other invasions in the 150 years in-between (some aiming for but not reaching Vienna). For, first, the new king of Hungary played a triple game. On one hand, he paid tribute to Sultan Suleiman. But he also had trouble from the West: the Habsburg Duke of Austria used his chance to invade, too, and claimed the Hungarian crown. I Ferdinand (whose mother tongue was Spanish!) had a mighty overlord in the person of his elder brother, Holy Roman Emperor Karl V (whose mother tongue was French and Flemish!). So, on the other hand, after long battles, the king of Hungary secretly promised inheritance to Ferdinand I for de-facto peace. In truth, all the while, he planned to wiggle free from both foreign influences - but that never really worked out, armies criss-crossed Hungary on punitive missions and looting raids. Worse, the year after the king's death, in 1541, both Ferdinand I and Sultan Suleiman sent a large army towards the then royal capital of Buda. The latter, claiming to protect the deceased king's infant son's rule, defeated the former. Then Sultan Suleiman sought to tidy up things with a bloodless coup. While Suleiman invited a number of the freewheeling barons for a coffee in his tent, some of his troops went for a night sight-seeing in Buda castle. The latter suddenly pulled out swords and took over walls and main buildings. The barons were next seen in a prison near Istanbul. The infant king and his mother were ordered to move to Transylvania. A surviving memory of Ottoman times in Budapest: the tomb of Gül Baba, with modern statue, on a hill overlooking the Danube. 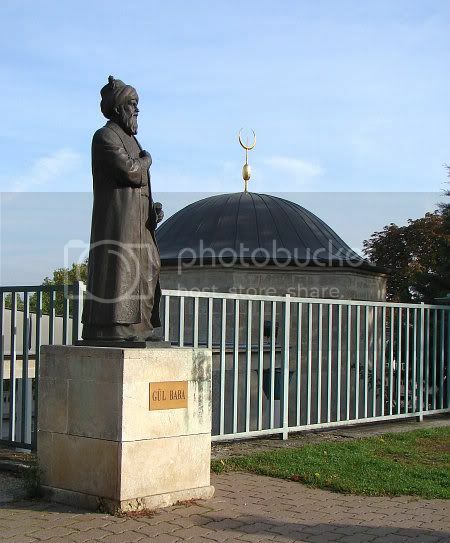 Gül Baba was a fighting dervish and poet, who arrived in Buda with the 1541 takeover, but died soon afterwards. The holy man was so revered that allegedly Suleiman I himself was among the coffin carriers. The tomb, built 1543-1548, became a pilgrimage site, and remained to this day -- for which reason it was restored in 1885 and again in 2000 with money from the Turkish state. Own photo 05/10/2008. This was the start of what historians in Hungary call the Tripartition: the Central and Southern parts of the former Kingdom of Hungary came under direct Ottoman control; Transylvania remained autonomous, though most of the time paying tribute to the Sultan; and the North and West fell to Austria (as its provinces of Royal Hungary and Croatia). However, war was far from over. There was no agreed border, wide regions suffered both double taxation and regular raids. These raids and further political machinations led to bigger invasions almost semi-annually. This was also a second chivalric age, with all the contradictions of the first -- say, it happened that an Ottoman commander buried a fallen castle captain and took his orphaned pages under his own tutelage; and it happened that the Sultan received his Hungarian liege king on the battlefield of Mohács, for good measure with the bones of the unburied dead heaped up on both sides of his passage. Despite Austria being part of a giant Habsburg Empire at the time (which extended beyond the Holy Roman Empire of German Nation to Spain and Sicily), the Ottoman Empire remained the superior force. 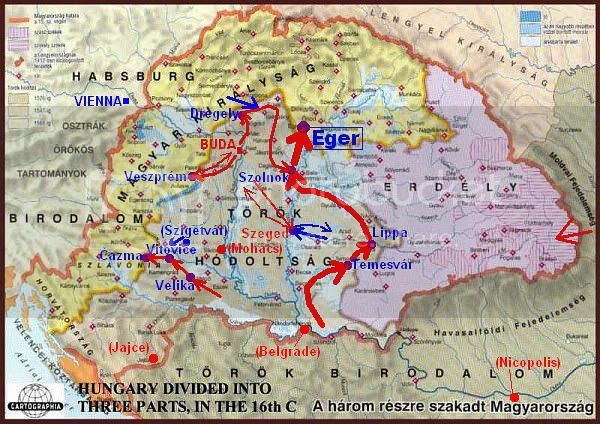 The reason its invasions only got to nab further smaller parts of Hungary was distance: Ottoman invasions were timed for the summer, to pass the Balkan mountains after thaw and return before winter. In 1551, the de-facto lord of Transylvania, bishop of Nagyvárad (today Oradea in Romania, German: Grosswardein) George Martinuzzi (who was of Italian-Croatian descent) began an intrigue that would cost him his life. He sought a reunification under Ferdinand I, invited troops, Ferdinand sent an Italian margrave with troops from Germany and Spain. But religion -- Ferdinand I was a re-catholiser, while the child king and much of the Transylvanian elite was Protestant and wanted to remain so -- foiled an agreement, the invited troops took over by force. Suleiman was furious. He first sent his trusted commander the Governor-General of Rumelia (Bulgaria), Sokollu Mehmet Pasha (who used to be a Janissar, and of Bosnian Serb origin) to take the castle above the city of Temesvár (today Timişoara in Romania; German: Temeschwar), but that proved a failure. The much larger punitive mission that followed was unusual for a number of reasons. For one, the Sultan was sick and preoccupied by Persia, so the invasion was one concocted by ambitious underling Kara Ahmed Pasha, as a self-paying enterprise. Second, instead of a direct hit on treacherous Transylvania or scheming Austria, the strategy was something ingenious on the level of the original Schlieffen Plan: with a push North across territory with weaker castles, Transylvania proper was to be isolated, and the flanks cleared for an eventual invasion of Vienna. Third, the enemy was to be misled and employed with raids all along the border from Croatia to Transylvania. Key among these was a campaign led by the Governor of Buda, Khadim Ali Pasha, to block eventual relief efforts in the center. Map of the 1552 campaign, showing all major sieges and troop movements. The red outline border is the Kingdom of Hungary's c. 1500, the darkest shade in the Ottoman occupied area (on the South) is conquest until Mohács, the coloured Tripartition areas are as of c. 1566-1591. My own drawing on map from Castles in Hungary. Ali Pasha first had to re-take Szeged from a counter-attacking army from Transylvania, but the enemy got too disorganized in looting to seriously resist that. But then the campaign moved according to plan -- though they were late. Ahmed Pasha's main army first took upon Temesvár, which wasn't fully repaired since last year and was manned by 2310, on 24 June. After one month of bloody battle and no relief forces in sight, rebellious commoners and mercenaries forced the castle's captain to negotiate a handover. However, this wasn't at all to the liking of the mercenaries on the Ottoman side, who spent much blood but were denied the loot. First was Lippa (today Lipova in Romania), whose captain (a Spanish nobleman from the Habsburg army occupying Transylvania), the same man who led the failed attack on Szeged and who failed to follow orders to relieve Temesvár, just fled. Meanwhile, Ali took two castles to the West resp. North of Buda, then eliminated an army sent from Austria. After taking further castles and large areas without a fight, the two Ottoman armies united for the siege of Szolnok. Szolnok was a city at a strategic position: on the Tisza river, at the crossing of the main North-South and East-West roads. Consequently, it got a newly built major fortress, well-staffed with mercenaries. But over the eight days while the Ottoman armies arrived and encamped, all the mercenaries deserted, the captain and the rest was captured. The unified Ottoman army -- contemporary sources report up to 250,000, modern estimates run from 80,000 down to 40,000, depending on estimated battle depletion -- marched further North. At the entrance of a valley towards mountainous Northern Hungary, the advance units reached Eger on 11 September (yes). 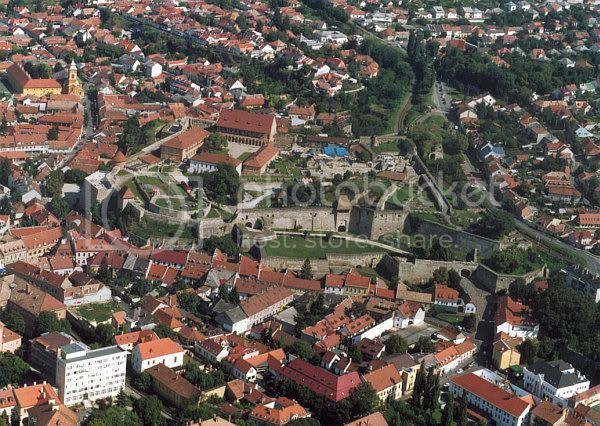 Eger was a city and bishopric seat, with a castle built after the Mongol invasion. As Kara Ahmed Pasha expected, the Habsburg Empire did not reinforce it strategically, not even sending mercenary reinforcements. The castle captain reinforced walls and sought units from nearby cities and noblemen on his own money. Together with commoners and peasants from nearby places, only 1918 people gathered inside. The battle started on 16 September with a cannon duel. At this time, castles weren't yet built to fully exploit cannons, they were only useful from the distance. And the first thing to do... was to try to take out the enemy's guns. Some horseback raids from the castle also helped. However, ultimately the bigger Ottoman guns had a safe distance. From then on, while some cannon balls also landed inside, their main role was: destroying the walls. The only thing the castle could do was re-lay stones in the cover of the night. But, towards the end of the siege, on long sections people were fighting literally on top of rubble heaps. After days of cannonball erosion, came the charges. Units ran towards the relative safety of the foot of the walls, carrying long ladders that had metal hooks on top, erected them, ran up -- and fell to their deaths. During the nights, the Ottoman commanders sent teams to dig tunnels for mines, which crews from the castle dug in again. Though, the miners may have succeeded once: on the evening of 4 October, a giant explosion blew up the tower in which gunpowder was stored (though bad handling is more likely). Two men were key for the defense. Drawing of István Dobó, based on the relief on his onetime gravestone. From the Hungarian Electronic Library One was castle captain István Dobó, who decided to make a last stand. Which he enforced mercilessly. He had his soldiers take an oath. When the usual siege psychological warfare began (Monthy Python based the "I fart in your general direction!" sketch in Monthy Python and the Holy Grail on real practice), he forbade any communication. Later, he responded to death threats by hanging a coffin with his name on it on two staffs atop the wall. On 30 September, Ottoman troops breached the outer gate. Since the bastion above it would have made an excellent position for cannons, Dobó had the inner castle cannons fire on the bastion -- with his own trapped soldiers inside -- until it collapsed on the heads of the entered troops. On 3 October, using a secret tunnel exit, the officer heading one of the units sent by a nearby city agreed the handover of the castle with the Ottomans, and led a unit in -- but they were caught, and Dobó had them executed publicly as traitors breaking their oaths. The other key man, Gergely Bornemissza (funny surname means: drinks-no-wine), was a student turned royal officer, son of a blacksmith, who constructed the unconventional weapons. He directed counter-tunnelling against miners, then dug his own mine tunnels under the battlefield, to blow them up at critical times. Against the protective wooden planks the attackers kept above their heads, and the mobile siege towers used in later attacks, Bornemissza made various firebombs. From 4 October, the Ottomans began to build earthen ramps. Bornemissza constructed multiple-exploding bombs, drums with scattergun filling, and stuffed large mill wheels full of guns and bombs with fuses. The deadly effect was noted in Ottoman sources, too. When everything failed, Kara Ahmed Pasha ordered a final all-out charge on the walls, which lasted two days (12-13 October). It started with cannon fire and a mock attack on one wall section, to draw the limited troops away from another section where troops could emerge suddenly from a forest. This time, Dobó called everyone into battle -- including women. The women of Eger became legendary, and again Ottoman chronicles mention them too. They threw stones and poured hot water, molten bitumen and lead down the siege ladders. This battle was extremely bloody. On the second day, Turkish officers chased their soldiers into battle with drawn swords. After it ended, Ahmed Pasha and Ali Pasha reportedly had a big fall-out, then decided to pull out before they get vulnerable to a cavalry rout -- and before winter breaks. So for three days, cannons fired farewell, while the cavalry set fire to the deserted villages nearby. On 17 October, Ahmed Pasha's troops left, the next day, Ali's, too -- their back units had to suffer the raids of Dobó's cavalry. The castle within the city of Eger today. The wall encircling the road ascending the hill was added after 1552. The rest is the old inner castle: the outer castle with the old gate was to the right, but it was demolished in 1701. Photo from Wikipedia. The 1552 invasion ended with a costly loss and failed to reach the cities in Northern Hungary, yet the -- lasting -- territorial gain was significant. Though for the time being, Transylvania remained in Austria's hands, on the long term, the loss of Szolnok meant semi-independence for Transylvania (restored by 1558), and thus the Tripartition status quo. The Ottoman Empire set a bounty on the head of Dobó and Bornemissza. In 1553, after Dobó's second-in-command was killed by peasants when he tried to collect some levy, Bornemissza became Eger's castle captain. He began to reinforce the castle, but the next year, he was lured to pursue a raiding party and captured. In 1555, Ahmed Pasha, who became Grand Vizier in the meantime, had him hanged in Istanbul. Dobó fared somewhat better. In 1553, he was named the Prince of Transylvania. However, the anti-Habsburg local nobility overthrew him after only three years. Thereafter (and, in fact, prior to Eger, too) he excelled in avariciousness: tax evasion, violent conflicts with neighbouring aristocrats. The latter became his undoing when in 1569, an intrigue got him arrested for conspiracy against Ferdinand I (by then Holy Roman Emperor). In 1572, soon after being cleared and released, he died as a broken man. According to legend, Dobó 'killed' the last besieger of Eger when a veteran of that battle visited his grave: filled with anger, he shot his gun at the tombstone, but the bullet bounced right back at him. 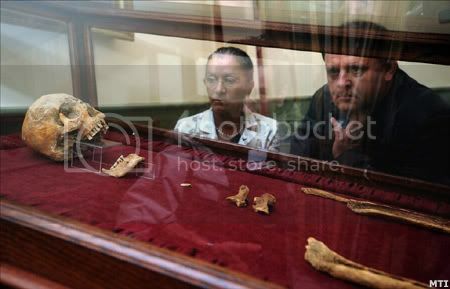 István Dobó's remains were re-discovered in his home Dobóruszka (today Ruská in Slovakia) just in June this year, and reburied with pomp and history-kitch. Photos from Index.hu. Sultan Suleiman would die of old age in 1566, during another last-stand battle (holding up another invasion of Vienna) at Szigetvár in Southwest Hungary. His successors tried no further major invasions. Austria for its part invited engineers from Italy and began the reinforcement of castles around the new 'border', creating a new végvár system, with Eger turned into one of the strongest. Despite its improved strength and 3,400 defenders, in 1596, a surprise Ottoman attack also took Eger: mercenaries rebelled and captured the castle captain, then left the gates unguarded while negotiating surrender -- only the 300 converting to Islam were left alive. In the 91 years of Ottoman rule, Eger was transformed into an important local centre. 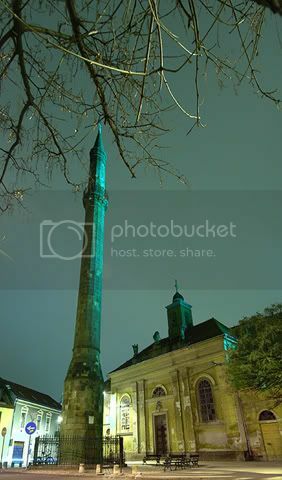 Kethüda minaret in Eger, the most Northern of the Ottoman Empire that is still standing. 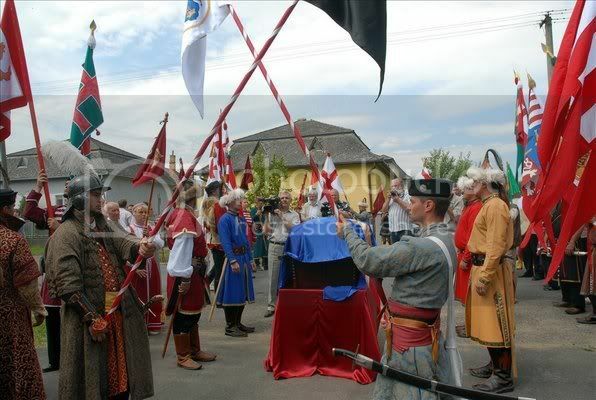 Photo from Eger city homepage. National romanticism in literature had a strong role in the creation of nations. The modern concept of the nation evolved from the aristocratic nation, the sense of community of the feudal class of larger and more stable kingdoms. Considering the multitude of regional, religious, language, political and class identities in and across the many warring, expanding, dividing, collapsing states, that was only natural. Though the extension of the nation to commoners started towards the end of the 100 Years War in France, it really took off with the centralisation allowed by technical advances. Most importantly, printed media -- which also standardized language -- that were read widely thanks to widening education. To create a sense of common destiny, you can't underestimate the importance of creating a "memory" of common history. This was primarily achieved by the arts: authors would trawl through old chronicles and legends and epics, and re-publish them or take them as inspiration with the new interpretation. That is, figures who in their time may have fought for the Cross, king, glory or personal enrichment -- and in fact may have been a great nuisance to many in their age -- ere turned into heroes somehow representing the modern nation. Think of Dumas's works, Beowulf, Kalevala, Niebelungenlied, Wilhelm Tell, Joan of Arc, and so on. the besieged pulled together regardless of class, even gender. 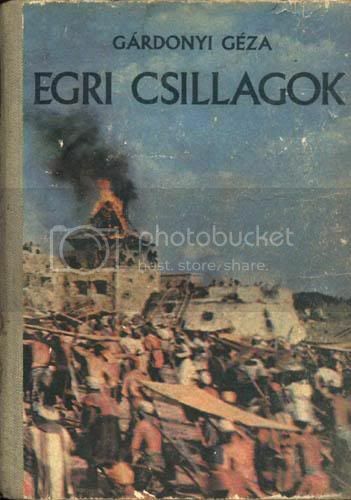 Stars of Eger book cover, illustrated with a frame of the 1968 movie adaptation. That was a megalomaniac project for the film industry of such a small country: they even constructed a replica Eger castle in a valley near Budapest, the ruins of which still stand. Now, in truth, the besieged people's willingness to fight to the death to defend their own appears to have been more local in nature (see the traitors from one of the auxiliary troops sent), and their battle cries were Christian ("Jesus Christ!" against "Allah Akbar!"). However, even these discordant details aren't missing from the book written by Géza Gárdonyi. Compared to other national romanticist authors, Gárdonyi went to unusual lengths to get a richness in historical detail (and achieve historical correctness apart from the omission of the negative sides of his heroes). With years of work, Gárdonyi sought out every written source preserved in the Austro-Hungarian empire, collected oral histories around Eger. From these, he wrote up a complete list of named individuals, assembled a day-by-day timeline. He studied local geography from a ballistic viewpoint, and also the famed underground tunnels. To get good descriptions of the soldiers, citizens and culture of the Ottoman Empire, he even travelled incognito to Istanbul to see things still off-limits to Western tourists. For real success with readers, a third pillar, a good storyline was needed. So Gárdonyi chose young Gergely Bornemissza as the main character, and fictionalised his early years with an odyssey across post-Mohács Hungary and the Ottoman Empire. He got a fictional adversary in the person of a Turkish soldier who wants his amulet back from Bornemissza, even kidnapping his son. So Gárdonyi could show the Turkish camp through the eyes of Bornemissza's wife, as he took her incognito into the castle via a secret tunnel, in the course of which that explosion of a wall section is explained as the foiling of another attempted intrusion across the tunnels. Gárdonyi also ended the story right after the victory at Eger, implying Bornemissza's later demise only in a half-sentence. Towards the end, there is a poignant but fictious scene: coming into the castle alone, a Turkish widow whose husband died in a Hungarian raid exchanges Bornemissza's son for her own (who hid inside a box that was part of the loot). Enjoy, was a lot of work... and half an hour late for the anniversary. It's even longer than one of my diaries ! :-) Well done. In common knowledge and most general history books, only the Crusades aiming for the Holy Land are mentioned (or mentioned as such). However, there were several more: against people declared heretics, against the pagans between German and Russian kingdoms (led by the Teutonic Order), and against the Ottoman Empire. I mentioned two in the diary that fitted into the logic of my intro: the 1456 one that relieved Nándorfehérvár, and the 1514 one that turned into a peasant rebellion. But I shal mention two more, both important defeats, which were international. At this time, the king of Hungary was Sigismund. A prince of Luxembourg, he became king by usurping his own wife: the daughter of the previous, Angevin king's daughter. He later rose to be Holy Roman Emperor, but his rule was a mess: he was the bad guy in the Hussite Wars, also pursued Bogumils in the east. In 1396, Pope Boniface IX helped Sigismund's efforts by calling for a Crusade. Sigismund's own 10-12,000 and 2,000 Wallachians were joined by 8-10,000 troops from all across Western Europe under the command of Philippe d'Artois, Constable of France. Just after crossing the Danube at Nicopolis (today Nicopol in Bulgaria), the crusaders met upon the Sultan's twice as big army. Then, according to chronicles, the undisciplined and arrogant French knights broke the battle order and charged for the Jannisares. Though inflicting heavy damage, relief troops beat them back, and then routed the entire crusader army. The Sultan was so angered that he had all captured French knights executed, except for the commanders kept for ransom. Thereafter, Sigismund limited himself to reinforcing the végvár frontier castles. This was in John Hunyadi's and Dracula's time -- the former and the latter's father participated. The king was of the Jagiellon house, 20-years-young Vladislaus I (who was simultaneously Wladislaus III of Poland). After a successful campaign, in 1443-4, he made peace with Sultan Murad II, who had to fight a rebellion at home. But Pope Eugene IV wasn't pleased, and with threats of excommunication, he pressed Vladislaus into a crusade doomed from the start. Vladislaus could only get Polish noblemen to join with the lie that the Ottomans attacked first. Serbia's then ruler didn't join. By the time the c. 20,000-man main army set off, Murad II crushed the rebellion, it was autumn, and because of their 2000 Hussite war wagons, the direct route was unpassable, so they weered East along the Danube. When they took Nicopolis, Wallachian voivod Vlad Dracul II (father of Dracula) joined with 4,000. When hearing the news that Sultan Murad II is coming for them with a 50,000-man army, instead of choosing an advantageous battlefield, the crusaders marched on until the Black Sea coast city of Varna, foolishly allowing the Ottoman army to come from behind and even block their retreat. In the battle, first the crusader right wing eliminated itself with a foolush rush into enemy reserves. Then, charges led by Hunyadi and Vlad Dracul II managed to crush both wings of the Ottoman army. But then young Vladislaus led a suicidal charge of 500 cavalry against the entire battalion of Jannisares -- he was slain, breaking the crusaders' morale. In the ensuing rout, 13,000 (more than half) crusaders were killed. The Ottomans also lost 20,000. This was the last attempt aiming for the heart of the Ottoman Empire until the Russo-Turkish War of 1877-1878. However, there were several more: against people declared heretics, against the pagans between German and Russian kingdoms (led by the Teutonic Order), and against the Ottoman Empire. Catholic Sweden had its own shares of crusades against the heathen finns while competing for that area with orthodox Novgorod. While cleaning up the text, I also updated the 1552 invasion map (you have to reload) with all the other strategic positions where key battles were fought from 1396 to 1566. 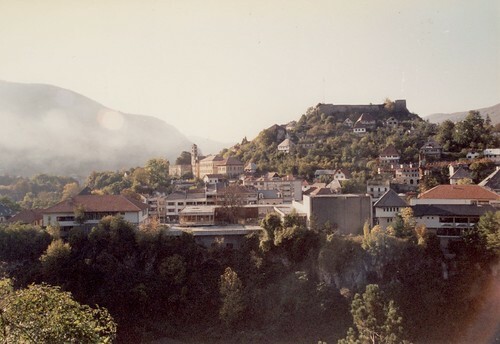 The one I haven't mentioned in the diary or above is Jajce, in Bosnia. This castle above a narrow and deep valley did not see big battles, but it was so important that it saw several. It was already contested between Hungary and Bosnia. The Ottomans first took it when crushing Bosnia in 1463, but Matthias Corvinus took it from them by Christmas the same year, and turned it into a key végvár. Failed sieges: 1464, 1501, 1502, 1516, 1524. Then it became an inconquerable island in Ottoman territory. Even when it fell in 1527, it was a surrender: the defenders were left without a captain, after he got hurt in a chivalric duel with an Ottoman officer. Then Jajce became an insurmountable fortress for the Ottomans. It was taken by Austria-Hungary in 1878 in heavy battle. Er, three: the 1481 campaign to re-take Otranto, on the heel of the Italian Boot, was a Crusade, too (the Vatican felt directly threatened). Sigismund. A prince of Luxembourg, he became king by usurping his own wife: the daughter of the previous, Angevin king's daughter. ...should be: "Sigismund. A prince of Luxembourg, he became king by usurping his own wife: she was queen as the daughter of the previous, Angevin king." Speaking of the battle of Nicopolis, we might also note the brave behaviour of the wallachian prince all through those dark years. "Although he was Orthodox, Mircea the Elder, the Prince of Wallachia, also participated with a large force in the Crusading army. His principality now constituted the border between Christendom and Islam. Wallachia (like Moldavia) was familiar with Ottoman battle strategies, as Mircea had inflicted several blows to the same Bayezid at the Battle of Karanovasa, the Battle of Rovine and the battles over the Principality of Karvuna in 1395." "Wallachia continued its stance against the Ottomans, having stopped another expedition in the next year, 1397, and in 1400 it defeated yet another expedition of Turks crossing the country. The defeat of Sultan Beyazid I by Timur (Tamerlane) at Ankara in the summer of 1402 opened a period of anarchy in the Ottoman Empire and Mircea took advantage of it to organize together with the Kingdom of Hungary a campaign against the Turks. 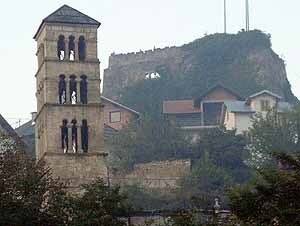 In 1404 Mircea was thus able to impose his rule on Dobrogea again. Moreover, Mircea took part in the struggles for the throne of the Ottoman Empire and enabled Musa to ascend that throne (for a brief reign). It was at this time that the prince reached the height of his power. Towards the end of his rein, Mircea signed a treaty with the Ottomans who recognized the freedom of Wallachia in return for a 3,000 gold pieces per year tribute (a small amount). Keeping the country free from becoming an Ottoman province ("pashalik") also meant keeping the Ottomans away from Western Europe. Where are the quotes from? brave behaviour of the wallachian prince all through those dark years. Whether one of the warlords of the time was brave or not, I couldn't care less, but Wallachia under its successive leaders certainly had a disproportionate share in the conflict, particularly as involuntary buffer state for the two mighty neighbours. (Actually, it started already when the Southern mighty neighbour was Bulgaria.) The situation was particularly hot -- and presumably quite bad for the population -- after Mircea and into Vlad III "Dracula"'s time, when the two empires would replace each others' liege voivods with bloody coups and punitive campaigns, and send their lieges on proxy wars to today's Bulgaria resp. Transylvania. Just between (checking) 1420 and 1427 alone, there have been eight coups -- every one of them involving Radu II The Bald, Mircea's son kept as hostage and educated in the Ottoman court (and hence Ottoman liege). The Bulgarian local population was in a particularly bad situation, too, and I wouldn't be surprised if some preferred the Ottomans. For, 30 years prior to the Battle of Nicopolis, Hungary conquered Vidin, and Angevin King Louis I ordered the forced conversion of the Orthodox population. ...brave, of course, more in the sense of, say, not motivated by foreign conquest - self-defense and the protection of others are, I guess, one of those few things making one's bravery a virtue - a difficult thing to find amongst the warlords of the time. One might also discuss the "two mighty neighbours", given the enormous superiority the Turks were already displaying, in both strength and equippment, with regards to any of their East-European targets. And they used that advantage to the fullest - at least until the famous Vienna siege in 1529, the one finally marking a stop to the Ottoman advance. It took 150 more years for the tide to turn for real. But that could well make the subject of another diary. Well, what can I say... have you read the diary at all? BTW, Mircea did expand Wallachia. Self-defense (Mircea had to deal with lots of Ottoman raids after all) and pride (in not shrieking back from a call into battle by the nominal feudal overlord or the Pope) are the most charitable motivations. But, given the prior record (I mention Vidin), who do you think would have got to rule in the lands taken "back" from the Ottoman Empire? And already during the campaign, you forget about loot -- and the feeding of the troops, which was usually at the "expense" of local peasants (dead or alive). 2) As discussed in the context of my upthread comments and the diary, it should have been obvious that "mighty" in "two mighty neighbours" is relative to Wallachia and the other buffer states. Wallachia's rulers faced demands for vassaldom (underlined with armed invasions) from its very formation in the 1330s. First from Hungary and Bulgaria. After the 14th-century Ottoman expansion, the Hungarian influence became overbearing, until Mircea could gain some autonomy. But from them on, rulers with the backing of the Kingdom of Hungary and the Ottoman Empire would replace each other in rapid succession, usually with significant outside meddling. I mentioned the eight coups in eight years after Mircea, but it continued so even if on a timescale of years. Vlad III (Dracula) would arrive as an Ottoman liege, then turn on them, and after much upheaval that included exile in Transsylvania, signifivant victories and raids towards both neighbours, imprisonment by Matthias Corvinus, and ended with assassination after being sent back to take the place of yet another Ottoman liege. 3) One can separately consider how the opponents of the Ottoman Empire in Europe compared to it in relative power. While, as I stated in the diary, Ottoman superiority can be assumed continuously from the end of the 14th century, that superiority could not always be qualified as "enormous". On one hand, due to personal unions and conquest, successive kings of Hungary had rather large realms under their control: Hungary's Angevin King Louis I also became King of Poland, King of Hungary Sigismund, as a Luxembourg, later became Holy Roman Emperor, Vladislaus I/III was King of both Poland and Hungary, he was followed by a Habsburg, then (as I told in the diary) Matthias expanded West and also aimed for Holy Roman Emperor, then Vladislaus Jagiellon/II was still co-King of Hungary and Bohemia. Later, Ferdinand I of Austria and Hungary would become Holy Roman Emperor, too (again see the diary). On the other hand, the Ottoman Empire had its times of vulnerability (which opponents failed to exploit, unlike in and after 1683) -- in particular around the time of the second crusade mentioned in my top-level comment. I referred to a prior successful campaign. That one, an attack in winter, got near the then capital Edirne (ex Hadrianopolis). The 1444 crusade itself could have turned out very differently, had the navies of Italian city-states blocked the passage across the Dardanelles, or had the land army made use of their Hussite war wagons: the Ottoman Empire would have lost not just an army but all its European possessions, and with that its economic superiority. FYI: modern Romania (and medieval Moldavia) may or may not be considered Eastern Europe (depending whether one considers the cultural factor of Eastern Orthodox religion or just geography), but the Ottoman conquests discussed here touched Southeastern Europe (the Balkans) and Central Europe (Hungarian Kingdom, Wallachia, Poland, Austria). The 1529 Siege of Vienna did not finally mark a stop of Ottoman advance -- the second to fifth sections covers just that explicitely. The 1529 campaign came because though the Ottomans considered Hungary a liege kingdom, Ferdinand I took over all of it in 1527, and then the exiled king John Szapolyai appealed to Suleiman. Both expansionary invasions and punitive missions beyond the borders continued after this confrontation. As I told in the diary, the real constraint on Ottoman expansion was the time limit dictated by the seasonal nature of campaigns - thus in 1529 (just like at Eger 23 years later), they had to abandon the siege with the arrival of the rainy season. Just three years later, in 1532, the next invasion aiming for Vienna lost time with the siege of a smaller castle (Kőszeg = Güns), then broke off the march in sight distance of Vienna and turned South, pillaging across Eastern and Southern Austria on its way home. From the assimilation of Central Hungary into the Empire in 1541 to 1566, Suleiman's armies were extending the Empire at the expense of Austria. In 1543, as a revenge for an attempted takeover of Buda by Ferdinand the previous year, Suleiman started another invasion aiming for Vienna, this time following the Danube. But this one got bogged down with the siege and punishment of some Hungarian towns that switched sides. Worth to note that in a peace in 1562, Ferdinand agreed to pay tribute to Suleiman, which was paid on and off for 40 years (effectively becoming a liege kingdom!). In 1566, another invasion that was probably aiming further got bogged down at the castle of a nobleman, and then Suleiman died during the siege. Ottoman conquest continued during the 15 Years' War (mentioned in the fifth part of my diary, with a link to an earlier diary that covered the years to and after the Second Siege of Vienna, from an angle I suppose unfamiliar to you). But its final extent in Europe was only reached in the Habsburg-Ottoman War of 1663-4 (fall of Érsekújvár/Neuhäusl, today's Nové Zámky), during which another run on Vienna was stopped in the battle of Szentgotthárd-Mogersdorf. The red dot on the map of Austria and its states above denotes the city of Ybbs. (Vienna is the small enclave near the Eastern borders.) This is how far West (part of) Ottoman troops got in the Danube valley during the 1532 invasion (their passage South was only a bit further East). Though that's still not the Westernmost reach -- half a century earlier, when Mathias Corvinus allowed raiding parties free passage as punishment for Austria, they reached Western Carinthia (the Souhernmost state of Austria). I wonder at what point in history the focus shifted from the physical boundaries to the political boundaries. I was thinking that I wanted to see a map showing the terrain and the Danube - and Ybbs, of course. Because at the time of the Ottoman invasion, the movement of people was like water - gravitational, following also the gravitationally influenced roads and the gravitational rivers. Check with Google Maps! They now have relief map, too. The bands reaching Ybbs must have had to cross the Northernmost chain of the Alps as they joined the rest of the Ottoman army. The main body, too, had to pass through a pass (though only c. 700 m above sea). ...and, er, I don't know on what route they reached Ybbs -- bypassing Vienna along the Danube, or crossing the Wienerwald mountains above Vienna. 3b) I forgot one further note on numbers -- an issue touched upon in my diary only implicitely. While the Ottoman Empire had superior manpower from the late 14th century, for the magnitude of that superiority, contemporary reports of troop strength should be viewed critically. On one hand, it was part of the Ottoman Empire's psychological warfare to spread rumours of the approach of an incredibly big army. As covered in the third part of my diary, the enemy could often be compelled to run. On the other hand, in Christian (or, on this subject more aptly: feudal) Europe, boosting the numbers of the enemy served both to heighten the valor of victors or to better excuse a defeat. Modern historians' estimates usually cut the standard figures for Ottoman invasion armies by 50% or more. For Eger, I mentioned that the standard figure of 150,000 (spread between "80,000 soldiers and innumerable freeriders" and 250,000) was halved (with a spread of 40-80,000). For the 1456 Siege of Belgrade, figures were similart: 150,000 vs. the modern 70,000. Figures were even more extreme for Suleiman's troops in the 1529 Siege of Vienna: from 200,000 upwards to 300,000. But modern estimates are around 90,000: it was surely Suleiman's biggest army, as he brought even Serbian and Moldovan vassal forces, but his entire regular army was less than 50,000, and the army that may have numbered 120,000 at the start had travelled for four and a half months (arriving very late on 26 September) and had a number of battles behind them (across Transylvania and Central Hungary for the vassal forces, Buda for the main force). A second aspect of comparisons is the 'value' of soldiers. Up to half of Ottoman invasion armies were irregular forces, while most Hungarian, Austrian (and Wallachian, Serbian) armies were almost exclusively feudal and/or professional. The numbers of regular soldiers compared more evenly, though I contended in the diary that just the lack of commoner foot-soldiers was a critical factor. So I think the best direct matchup was in the 1456 Siege of Belgrade: regular units were 18,000 (castle crew+Hunyadi) against 40,000 (Mehmed II), while irregular units were 30,000 (John Capistran's crusaders) vs. 30-40,000 (Mehmed II) at the outset, with a more significant reduction in Mehmed's forces by the final battle. Thank you for your exhaustive explanations, DoDo. I was of course aware of much of all this - not in so much detail though. I will return on this later, since there are other replies as well. For now I'll just make an attempt (probably quite boring by its very retrospective nature) at clarifying my own words. By bravery and self-defense I meant Mircea the Elder, of course. In general I hardly find the german or the french crusaders' attitude (let alone goals, be those real or displayed) either brave, or extremely honourable. Wr to the two mighty neighbours: of course your viewpoint might* stand in relation with Wallachia; much less so if we look at the greater picture: when you have a frog, a fly and a couple of ants, well, from the frog's perspective, the others are all ants. *I say "might" thinking at that Middle-Ages custom of marrying to enlarge territory. In reality, those were hardly genuine states; accumulation of territory in the feudal order was SO ephemerous that it really doesn't deserve much attention. I don't even speak about Hungary, which, like any other state, had its better and worse moments. But just look at the german "empire", first Roman, then Roman of German nation, then Habsburgic really, Austrian, finally Austro-Hungarian and ending with two small (relative to their neighbours, let alone to the Barbarossa's realm) albeit very honourable states: modern Austria and modern Hungary. And with Spain, spanish America with all that bullion. This being the era of Cortez and Pizzaro and all. Fantastic diary - what a lot of work there! Excellent diary, I'll comment more when awake and sober. I've opened my eyes and the world isn't a pretty sight. Looking at the etching of the castle walls, its been remodelled since the introduction of gunpowder based siege trains. The angled walls to deflect the impact of shot had been introduced since Charles VIIIth had introduced the mobile siege train, which was improvement over the turkish siege train you mention. I heard that the Turkish army was alarmed by the wine-stained beards of the defenders of Eger. They wondered what these crazy Magyars drank and heard that it was "bull's blood," hence the nickname for a kind of wine. I've read the novel and have a copy (in translation) in my library. A great story, heartbreaking as is most of Hungarian history. Now, what I'd really like to know about is the life of Szechenyi Istvan in the last decades of his life, when he was institutionalized but still writing and agitating for progress in his beloved country. Wow, haven't yet heard the legend myself. Upon checking, the origin of the name is more recent: a poet from a rival wine-groving region invented the name "bull's blood" in 1846; and the legend must be still younger (it wasn't incorporated into the novel, but the anachronistic wine brand name was). Isn't there a play with a diaologue between Szechenyi and Kossuth, two very remarkable men. The amount of work did and the number of fields that Szechenyi contributed to are astonishing. The fact that he never gave up even when institutionalized is amazing. As for writing about him, I doubt it. I don't know enough. Right now, I've been reading about another remarkable man, Abdul Ghaffar Khan or Badshah Khan, a Pashtun leader and friend of Gandhi who led a nonviolent army, yes a literal army organized in troops and with a real officer corps, 100,000 strong in the area where the Taliban is active today. He based his nonviolence on Islamic teachings and Pashtun tradition. Would be good to remember him these days. I think you should not hold back yourself on doubts over the level of your knowledge to write diaries on both Széchenyi and Abdul Ghaffar Khan. It's the narrative of what captured you that counts, details can be filled in/other viewpoints can be presented by commenters. Isn't there a play with a diaologue between Szechenyi and Kossuth, two very remarkable men. The conflict between the two (with Széchenyi as the moderate advocate of slow progress and Kossuth as the radical reformist -- though Kossuth himself was overtaken by the 1848 revolutionaries) was legendary and very public. As for a literary coverage, upon checking, maybe you mean László Teleki's unfinished drama (written from 1847)? Great diary, DoDo. Just as well we have the EU now! Do Hungarians support Turkish entry? The only poll I'm aware of are Eurobarometer polls. In EB69, support was 45% (vs. EU-27 average of 31%). Of other candidates, Serbia, Kosovo and Albania got less support, Macedonia just as much, Bosnia, Ukraine slightly more, all others had majority support (including Montenegro: 53%, Croatia: 80%).